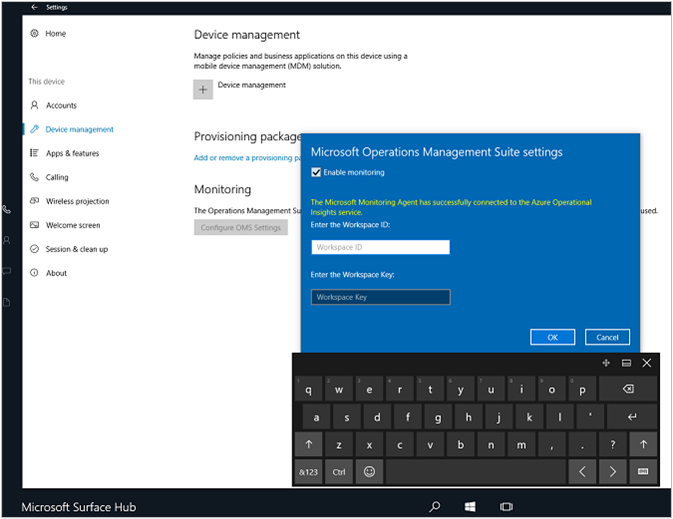 This article describes how you can use the Surface Hub solution in Azure Monitor to monitor Microsoft Surface Hub devices. The solution helps you track the health of your Surface Hubs as well as understand how they are being used. Each Surface Hub has the Microsoft Monitoring Agent installed. Its through the agent that you can send data from your Surface Hub to a Log Analytics workspace in Azure Monitor. Log files are read from your Surface Hubs and are then are sent to Azure Monitor. Issues like servers being offline, the calendar not syncing, or if the device account is unable to log into Skype are shown in the Surface Hub dashboard in Azure Monitor. By using the data in the dashboard, you can identify devices that are not running, or that are having other problems, and potentially apply fixes for the detected issues. A Log Analytics subscription level that will support the number of devices you want to monitor. Log Analytics pricing varies depending on how many devices are enrolled, and how much data it processes. You'll want to take this into consideration when planning your Surface Hub rollout. Manually through Settings on your Surface Hub device. You can monitor the health and activity of your Surface Hub using Azure Monitor. You can enroll the Surface Hub by using Intune, or locally by using Settings on the Surface Hub. You'll need the workspace ID and workspace key for the Log Analytics workspace that will manage your Surface Hubs. You can get those from the workspace settings in the Azure portal. Navigate to Settings > Connected Sources. Create or edit a policy based on the Surface Hub template. 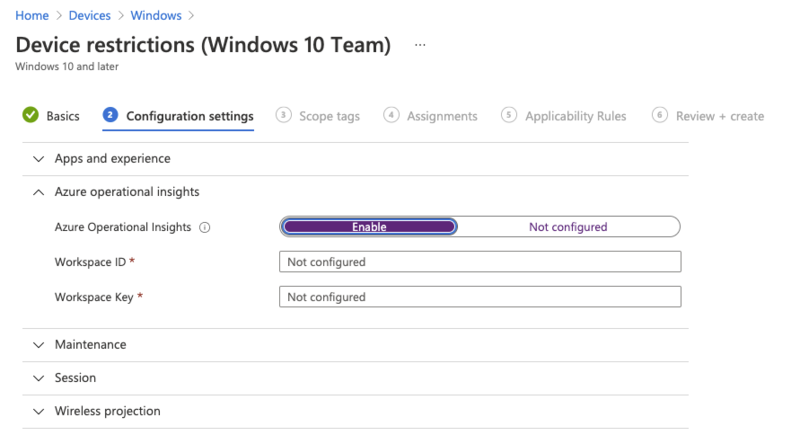 Navigate to the Azure Operational Insights section of the policy, and add the Log Analytics Workspace ID and Workspace Key to the policy. Associate the policy with the appropriate group of devices. Intune then syncs the Log Analytics settings with the devices in the target group, enrolling them in your Log Analytics workspace. You'll need the workspace ID and workspace key for the Log Analytics workspace that will manage your Surface Hubs. You can get those from the settings for the Log Analytics workspace in the Azure portal. From your Surface Hub, open Settings. Enter the device admin credentials when prompted. Click This device, and the under Monitoring, click Configure Log Analytics Settings. In the Log Analytics settings dialog, type the Log Analytics Workspace ID and type the Workspace Key. A confirmation appears telling you whether or not the configuration was successfully applied to the device. If it was, a message appears stating that the agent successfully connected to Azure Monitor. The device then starts sending data to Azure Monitor where you can view and act on it. Monitoring your Surface Hubs using Azure Monitor is much like monitoring any other enrolled devices. Data collected by this monitoring solution is available in the Azure Monitor Overview page in the Azure portal. Open this page from the Azure Monitor menu by clicking More under the Insights section. Each solution is represented by a tile. Click on a tile for more detailed data collected by that solution. When you click on the Surface Hub tile, your device's health is displayed. You can create alerts based on existing or custom log searches. Using the data Azure Monitor collects from your Surface Hubs, you can search for issues and alert on the conditions that you define for your devices. Use Log queries in Azure Monitor to view detailed Surface Hub data. Create alerts to notify you when issues occur with your Surface Hubs.